One of the most obvious libraries a programming language should have is one to deal with date and time. However, experience shows that such a library is harder to design than it sounds. The problem is the amount of flexibility and precision the library should provide. In fact, in the past, the interfaces to system time provided by C and POSIX switched from seconds to milliseconds, then to microseconds, and finally to nanoseconds. The problem was that for each switch, a new interface was provided. For this reason, a precision-neutral library was proposed for C++11. This library is usually called the chrono librarybecause its features are defined in <chrono>. In addition, the C++ standard library provides the basic C and POSIX interfaces to deal with calendar time. Finally, you can use the thread library, provided since C++11, to wait for a thread or the program (the main thread) for a period of time. A duration of time is defined as a specific number of ticks over a time unit. One example is a duration such as “3 minutes” (3 ticks of a “minute”). Other examples are “42 milliseconds” or “86,400 seconds,” which represents the duration of 1 day. This concept also allows specifying something like “1.5 times a third of a second,” where 1.5 is the number of ticks and “a third of a second” the time unit used. A timepoint is defined as combination of a duration and a beginning of time (the so-called epoch). A typical example is a timepoint that represents “New Year’s Midnight 2000,” which is described as “1,262,300,400 seconds since January 1, 1970” (this day is the epoch of the system clock of UNIX and POSIX systems). The concept of a timepoint, however, is parametrized by a clock, which is the object that defines the epoch of a timepoint. Thus, different clocks have different epochs. In general, operations dealing with multiple timepoints, such as processing the duration/difference between two time-points, require using the same epoch/clock. A clock also provides a convenience function to yield the timepoint of now. In other words, timepoint is defined as a duration before or after an epoch, which is defined by a clock (see Figure 5.4). For more details about the motivation and design of these classes, see [N2661:Chrono].27 Let’s look into these types and concepts in detail. Note that all identifiers of the chrono library are defined in namespace std::chrono. You can process the sum, difference, product, or quotient of two durations. You can add or subtract ticks or other durations. You can compare two durations. The important point here is that the unit type of two durations involved in such an operation might be different. Due to a provided overloading of common_type<> (see Section 5.4.1, page 124) for durations, the resulting duration will have a unit that is the greatest common divisor of the units of both operands. yields a duration of 41,990 ticks of unit type milliseconds ( seconds). yields false. In both cases, d1 gets expanded to 5 ticks of second, and d2 gets expanded to 3 ticks of second. So the sum of 3 and 5 is 8, and 5 is not less than 3. In the preceding example, we use the member count() to yield the current number of ticks, which is one of the other operations provided for durations. Table 5.22 lists all operations, members, and types available for durations besides the arithmetic operations of Table 5.21. Note that the default constructor default-initializes (see Section 3.2.1, page 37) its value, which means that for fundamental representation types, the initial value is undefined. s << "[" << d.count() << " of " << R::num << "/"
cout << "raw: " << hh << "::" << mm << "::"
cout << "     " << setfill(’0’) << setw(2) << hh.count() << "::"
<< setw(2) << mm.count() << "::"
<< setw(2) << ss.count() << "::"
Finally, class duration provides three static functions: zero(), which yields a duration of 0 seconds, as well as min() and max(), which yield the minimum and maximum value a duration can have. A clock defines an epoch and a tick period. For example, a clock might tick in milliseconds since the UNIX epoch (January 1, 1970) or tick in nanoseconds since the start of the program. In addition, a clock provides a type for any timepoint specified according to this clock. The interface of a clock provides a function now() to yield an object for the current point in time. A timepoint represents a specific point in time by associating a positive or negative duration to a given clock. Thus, if the duration is “10 days” and the associated clock has the epoch of January 1, 1970, the timepoint represents January 11, 1970. The interface of a timepoint provides the ability to yield the epoch, minimum and maximum timepoints according to the clock, and timepoint arithmetic. Table 5.23 lists the type definitions and static members required for each clock. The system_clock represents timepoints associated with the usual real-time clock of the current system. This clock also provides convenience functions to_time_t() and from_time_t() to convert between any timepoint and the C system time type time_t, which means that you can convert into and from calendar times (see Section 5.7.4, page 158). The steady_clock gives the guarantee that it never gets adjusted.29 Thus, timepoint values never decrease as the physical time advances, and they advance at a steady rate relative to real time. The high_resolution_clock represents a clock with the shortest tick period possible on the current system. Note that the standard does not provide requirements for the precision, the epoch, and the range (minimum and maximum timepoints) of these clocks. For example, your system clock might have the UNIX epoch (January 1, 1970) as epoch, but this is not guaranteed. If you require a specific epoch or care for timepoints that might not be covered by the clock, you have to use convenience functions to find it out. Here, for example, the system and the high-resolution clock have the same precision of 100 nanoseconds, whereas the steady clock uses milliseconds. You can also see that both the steady clock and high-resolution clock can’t be adjusted. Note, however, that this might be very different on other systems. For example, the high-resolution clock might be the same as the system clock. might print a negative duration if the clock was adjusted in the meantime. For the same reason, using timers with other than the steady_clock might change their duration when the system clock gets adjusted (see Section 5.7.5, page 160, for details). 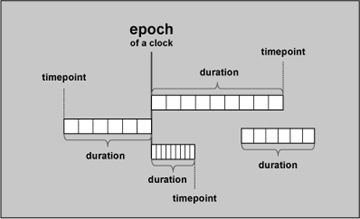 The epoch, which the default constructor of class time_point yields for each clock. The current time, which the static member function now() of each clock yields (see Section 5.7.3, page 149). The minimum timepoint, which the static member function min() of class time_point yields for each clock. The maximum timepoint, which the static member function max() of class time_point yields for each clock. removes the trailing newline character. Note that ctime() takes the local time zone into account, which has consequences we will discuss shortly. Note also that this convenience function probably will work only for system_clocks, the only clocks that provide an interface for conversions to and from time_t. For other clocks, such an interface might also work but is not portable, because the other clocks are not required to have epoch of the system time as their internal epoch. Note also that the output format for timepoints might better get localized by using the time_put facet. See Section 16.4.3, page 884, for details, and page 886 for an example. Thus, tp is declared as the timepoint of the system_clock. Having the clock as template argument ensures that only timepoint arithmetic with the same clock (epoch) is possible. Note that it’s 1 o’clock rather than midnight. This may look a bit surprising, but remember that the conversion to the calendar time with ctime() inside asString() takes the time zone into account. Thus, the UNIX epoch used here—which, again, is not always guaranteed to be the epoch of the system time—started at 00:00 in Greenwich, UK. In my time zone, Germany, it was 1 a.m. at that moment, so in my time zone the epoch started at 1 a.m. on January 1, 1970. Accordingly, if you start this program, your output is probably different, according to your time zone, even if your system uses the same epoch in its system clock. Yes, here, the difference is 2 hours for now(), because this timepoint is when summertime is used, which leads to a 2-hour difference to UTC in Germany. In general, time_point objects have only one member, the duration, which is relative to the epoch of the associated clock. The timepoint value can be requested by time_since_epoch(). For timepoint arithmetic, any useful combination of a timepoint and another timepoint or duration is provided (see Table 5.24). allow adjusting timepoints by using timepoint arithmetic. The cast uses static_cast<> for the destination unit, which for ordinary integral unit types means that values are truncated instead of rounded. For this reason, a duration of 47 hours and 55 minutes converts into 1 day. Subtracting 50 years of 365 days does not take leap years into account, so the resulting day is January 16 instead of January 3. When deducting another 50 years the timepoint goes below the minimum timepoint, which is March 5, 1904 on my system (see Section 5.7.3, page 152), so the result is the year 2005. No error processing is required by the C++ standard library in this case. This demonstrates that chrono is a duration and a timepoint but not a date/time library. You can compute with durations and timepoints but still have to take epoch, minimum and maximum timepoints, leap years, and leap seconds into account. The C++ standard library also provides the standard C and POSIX interfaces to deal with date and time. In <ctime>, the macros, types, and functions of <time.h> are available in namespace std. The types and functions are listed in Table 5.25. In addition, the macro CLOCKS_PER_SEC defines the unit type ofclock() (which returns the elapsed CPU time in seconds). See Section 16.4.3, page 884, for some more details and examples using these time functions and types. Note that time_t usually is just the number of seconds since the UNIX epoch, which is January 1, 1970. However, according to the C and C++ standard, this is not guaranteed. Note again that both makeTimePoint() and asString() take the local time zone into account. For this reason, the date passed to makeTimePoint() matches the output with asString(). Also, it doesn’t matter whether daylight saving time is used (passing a negative value to t.tm_isdst inmakeTimePoint() causes mktime() to attempt to determine whether daylight saving time is in effect for the specified time). Again, to let asString() use the universal time UTC instead, use asctime(gmtime(...)) rather thanctime(...). For mktime(), there is no specified way to use UTC, so makeTimePoint() always takes the current time zone into account. Section 16.4.3, page 884, demonstrates how to use locales to internationalize the reading and writing of time data. sleep_for() and sleep_until() are provided by this_thread to block threads (see Section 18.3.7, page 981). try_lock_for() and try_lock_until() are provided to specify a maximum interval when waiting for a mutex (see Section 18.5.1, page 994). wait_for() and wait_until() are provided to specify a maximum interval when waiting for a condition variable or a future (see Section 18.1.1, page 953 or Section 18.6.4, page 1010). blocks the current thread until the system clock has reached a timepoint 10 seconds later than now. Although these calls look the same, they are not! For all ..._until() functions, where you pass a timepoint, time adjustments might have an effect. If, during the 10 seconds after calling sleep_until(), the system clock gets adjusted, the timeout will be adjusted accordingly. If, for example, we wind the system clock back 1 hour, the program will block for 60 minutes and 10 seconds. If, for example, we adjust the clock forward for more than 10 seconds, the timer will end immediately. If you use a ..._for() function, such as sleep_for(), where you pass a duration, or if you use thesteady_clock, adjustments of the system clock usually will have no effect on the duration of timers. However, on hardware where a steady clock is not available, and thus the platform gives no chance to count seconds independently of a possibly adjusted system time, time adjustments can also impact the ..._for() functions. All these timers do not guarantee to be exact. For any timer, there will be a delay because the system only periodically checks for expired timers, and the handling of timers and interrupts takes some time. Thus, durations of timers will take their specified time plus a period that depends on the quality of implementation and the current situation.